Each morning it is my custom to rise early and spend time in contemplative prayer. I am fortunate to enjoy a small office in the home I share with two other sisters that overlooks the backyard. Outside the glass door, the beauty of each season awaits my presence and attention. This is my place for solitude, my place for centering my day in God. It is in this space that I pondered the Gospel reading from Matthew for this day, the Feast of St. Joseph. I looked for a connection between the mission and work of Catholic Mobilizing Network (CMN) and the patron and protector of the family of the Universal Church, St. Joseph. Having recently joined CMN's Board of Directors and attended my first board meeting in Washington, DC, the energy and passion of the board and staff I met there was fresh in my mind and heart. In his video series, "Who Cares About the Saints?," Fr. James Martin, SJ describes Joseph’s presence in the lives of Jesus and Mary as "the hidden life." As I explore the facts about Joseph recorded in Matthew I can only agree. In fact, Joseph does not speak at all and is mentioned only three times! In each instance it is an angel of God who visits Joseph to announce his role in the story of salvation history and the lives of Mary and Jesus. To speak of the "hidden life" of Joseph in no way implies passivity. On this Feast Day, the Gospel passage from Matthew tells us that Joseph, already engaged to Mary, is very awake, aware of and focused on Mary’s pregnancy and the law of Moses that prescribes stoning for such suspected adultery. Surely his heart was broken as treasured thoughts of marriage and a future with Mary were shattered by her news. This action of Joseph reveals what law alone cannot bestow: mercy, the unconditional mercy of God. In response, an angel of God visits Joseph in a dream and assures him, “Don’t be afraid to take Mary as your wife. It is by the Holy Spirit that she has conceived this child." When Joseph awoke, he did as the angel had directed him. 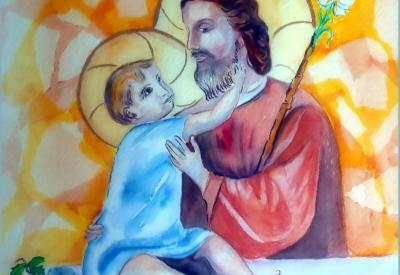 It is here, in God’s unconditional mercy, that I discover a connection between the mission and work of CMN and St. Joseph. On this feast day of St. Joseph may we recommit ourselves to be and act out of the same God-like unconditional mercy that characterized Joseph. May we seek to build a culture of life as we engage others in restorative practices that seek to repair harm through transformative encounters that model Jesus reconciling way — the way of God’s unconditional mercy. Sister Rita Ann serves on the Board of Directors of CMN and acts as the liaison to its sponsor, the Congregation of St. Joseph (CSJ). In addition to serving two terms on the CSJ Leadership Team, Sr. Rita Ann has held positions at Sisters of St. Joseph as a Formation Director, the Director of Religious Education, Parish Formation. She was also Pastoral Associate at St. Joseph Hospital and Pastoral Minister at St. Catherine of Siena.